Now with WiFi connection and upgraded software. Taptilo is an all-in-one braille education solution that includes a combination of a hardware device with the latest braille cell technology and an innovative application and software with improved user interface. With its interactive software and personalization features, as well as a growing library of available content for wireless download, Taptilo makes braille education efficient, effective, and of course, fun! More than ever, there is a need for a fun and innovative tool for braille education that meets the goals of today’s educators and braille learners. Meet Taptilo, the first smart device dedicated to braille education. With Taptilo, it becomes extremely convenient to personalize your lessons, play games with your student, track learning progress, and reinforce learning through various activities. Taptilo provides immediate tactile and audio feedback for the students to help them pick up the learning. It also has various self-study activities with interactive audio instructions that allows students to practice on their own under minimal supervision. With the new WiFi feature, Taptilo 2.0 becomes even more versatile. Easily download and install new educational content directly to your device with a few taps on your app. Keep your device up-to-date with the latest firmware upgrades and features. Enjoy access to the online library of content, wherever you are connected! With tons of interactive and personalization features, Taptilo can effectively lower the barrier to early braille education and create a friendly and collaborative environment for learning. Perfect for early introduction to braille literacy. Save time prepping for class and spend more time interacting with students. 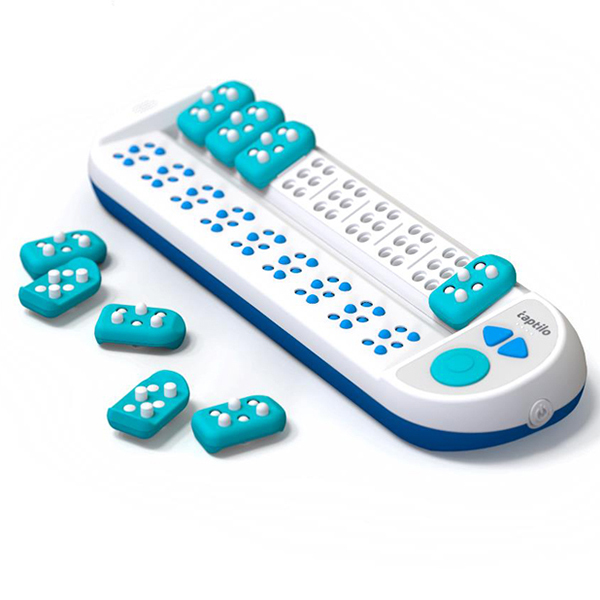 With Taptilo, teaching braille can be even more fun and fulfilling! Taptilo 2.0, now with WiFi connectivity!